Grave-cover fragment (memorial headstone to Frithburga). 22.5'' in height, 20'' in width, and 11'' in thickness at the base, 7'' in thickness at the top. Grave-cover fragment (memorial headstone to Frithburga), dated to the ninth or tenth century. 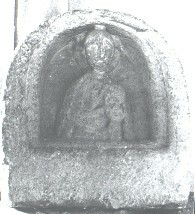 In a niche on the front of the stone there is a bust of a figure, thought to be Christ. He is holding a book in his left hand, and his right hand is raised in blessing. His head is surrounded by a large halo, and he is wearing a cloak. Green, A.R., Green, P.M., Saxon Architecture and Sculpture in Hampshire 1st, Warren, Winchester (1951) Stones, Sculpture, England..